Aiguille de Blaitiere from town. I went to Chamonix last winter and was able to trace the line of a first ascent that we did back in 1976/77. 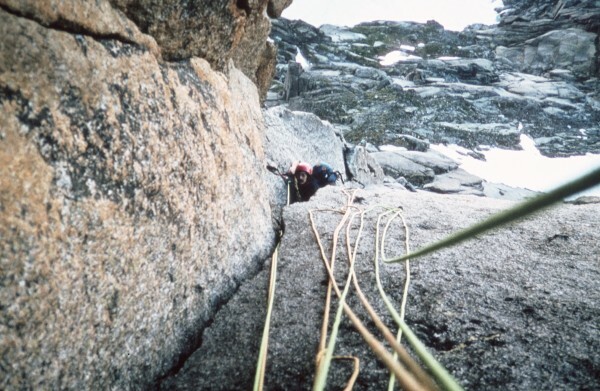 Since that time, Chamonix has become a destination for crag climbing (as opposed to ice and mixed routes), and the route we did has become a popular outing. 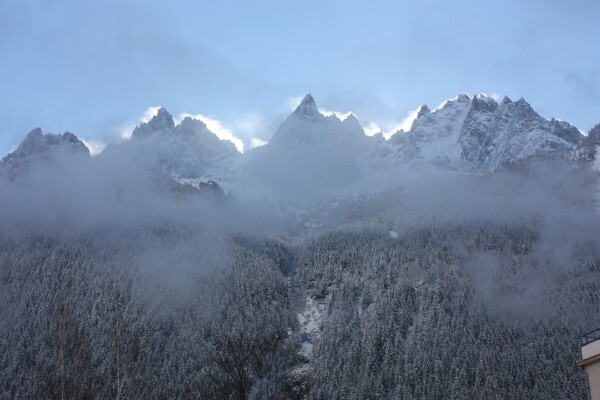 This is a late trip report on the first ascent of the “Red Pillar” of the Aiguille de Blaitiere. 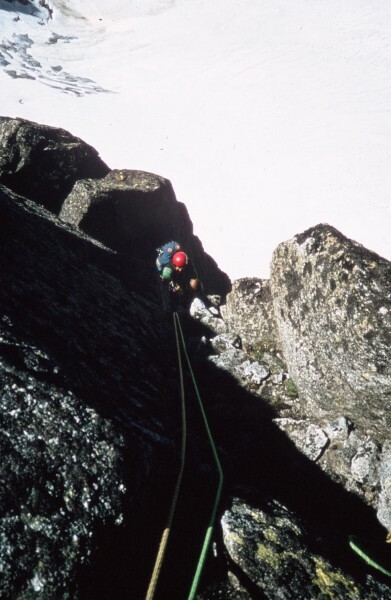 Mike Graham and I climbed the first several pitches of it in the summer of 1976, and Rob Muir and I completed the route in the summer of 1977. In this link, the route is the deeply shadowed, left facing corner on the right side of the picture. 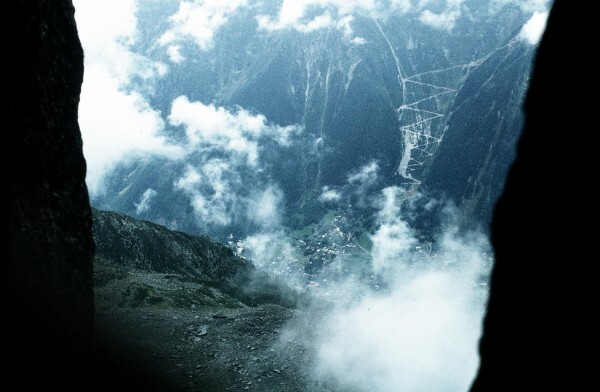 Mike and I visited Chamonix in 1976. We prepared by studying the two volumes of Vallot guide, in the English translation published by the British Alpine Club. We also photocopied and brought with us selected pages from Rebuffat’s “100 best routes in the Mont Blanc Range”, a classic that had just become available in the US. We were in the Valley in the spring and before we left for Chamonix, Bridwell took us aside and gave us a warning, “Be careful over there, lots of people die in the Alps and I don’t want it to happen to you.” I recall it well because most Camp 4 conversation was mainly macho bluster and bravado and the Bird’s words were heartfelt. It was like getting advice from a big brother. After sampling the some of the established rock routes, like the Rebuffat on the Midi and the American Direct on the Dru, we found that we could comfortably free climb these classic routes. 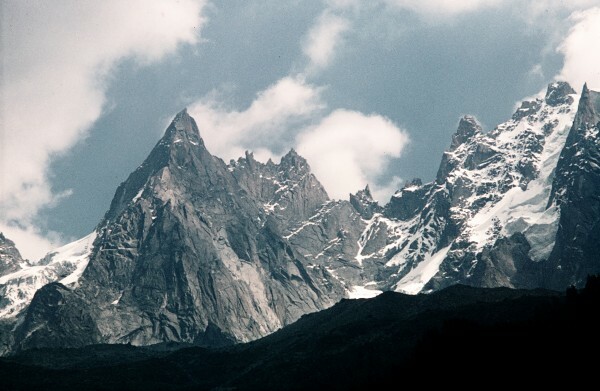 Viewed from the main square of Chamonix, the most prominent rock face is the Aiguille de Blaitiere. It is a complex mountain with vast swaths of dry rock on its west face. One evening we were in town having a vin rouge, when the light struck a buttress, low on the West face, that contained a prominent, left facing corner that would have looked at home in Yosemite.The guidebooks said nothing about the entire area left of the famous “Fissure Brown” route which goes up the middle of the West Face toward the summit. The next day we went up the Midi ‘frique, but got off halfway up. The approach was somewhat over an hour, but pretty straightforward. As was our practice in Chamonix, we approached in Superguides to deal with possible snow or ice and carried EB’s for the rock pitches. When we switched to EBs, we carried the mountain boots in our packs. The big corner began a couple of hundred feet off the ground, so we oriented ourselves directly below it and started up. Mike led an approach pitch, in a slabby area with few and discontinuous cracks. He had a banana before starting up (no energy bar industry in those days), and posed for this shot, although he was not then and has never been, a poseur. 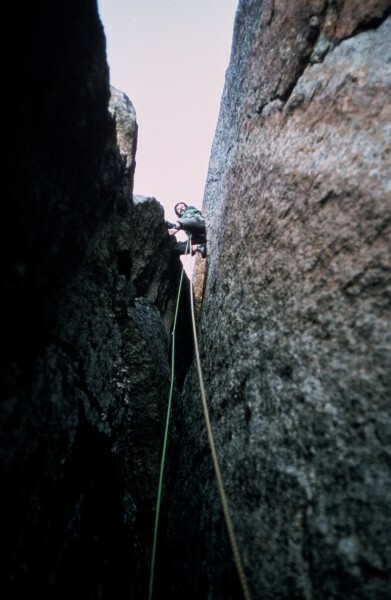 This is me on the crux pitch, seeking to connect to the main dihedral above. It turned out to be climbing between discontinuous cracks with less than comfortable protection, with the crux around mid 5.10. This got us to the big dihedral which turned out to be a moderate hand crack (5.8?) in a corner that widened into an easy chimney. For Mike, it was the work of a moment to lead that pitch, but the weather was closing in. Rick following the main corner. The climbing was straightforward and we used all hexes and stoppers. We had climbed perhaps three quarters of the way up the big corner, when it started spitting rain. We rappelled off after it turned into a steady rain and we didn’t get a chance to try it again that season. Rainy Chamonix from the chimney. The next year, Rob Muir and I finished off the climb all the way to the ridgeline. 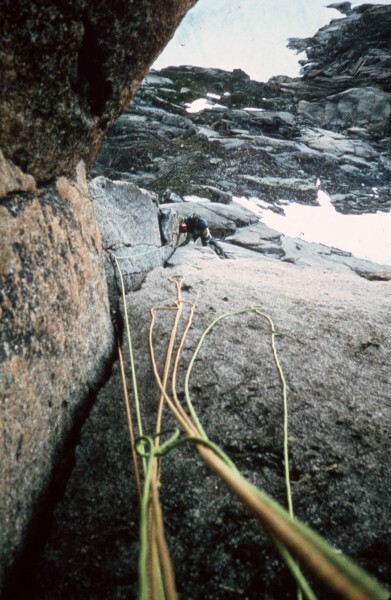 These photos are from 1977 when Rob and I completed the route, a beautiful day on fine rock. Piola’s topo has the route beginning to the left of where we started, traversing into the big corner on easy ground, and does not mention the direct start that we found. The crux for us was this direct start, which we figured was about mid 5.10. If you are in Chamonix, it’s a worthwhile route protected easily with nuts, and it takes full advantage of the cable car approach. With the rappel bolts installed for descents from the Red Pillar, as shown in the Piola guide, access couldn’t be easier, since you can leave the approach shoes at the base. 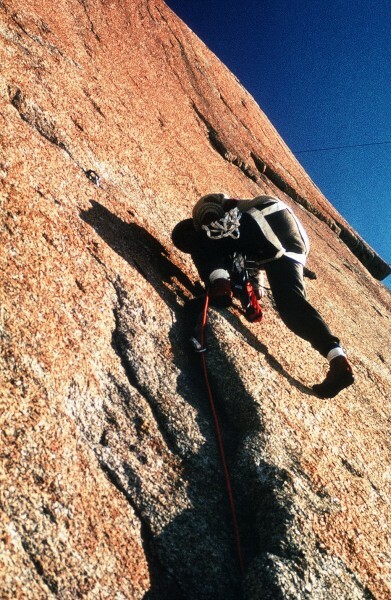 We called the route, “Old Wave,” since we preceded the free climbing trend in Chamonix by almost a decade. First Ascent July 1976/1977; Rick Accomazzo, Mike Graham, Rob Muir, TD 5.10. 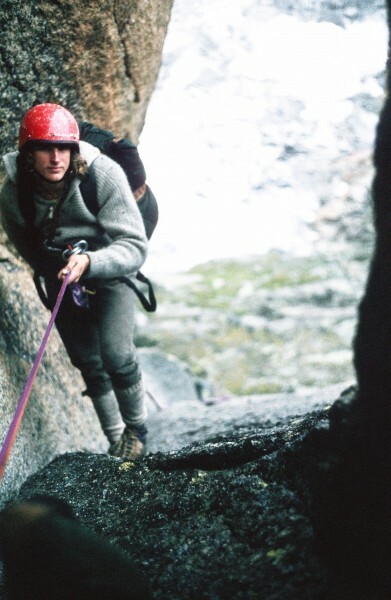 Rick A is a climber from Boulder, Colorado. Wow-Great read for a Sun morning, Classic on a Classic. Celebration of a Nicaraguan banana, by Americans on a French mountain. How international can you get? I like your comment about "feeling comfortable" on the Midi and the Dru. I wonder why the 1985 party wanted to call it "The Diamonds of the President"? It sounds like neither they nor the guidebook writer knew of your climb. Now this is too freekin' awesome, and the reason ST exists! Too bad more of us don't have the tales AND the pictures to go with it. Proud, clean and futuristic effort and a great TR. More Stonemaster excellence! I love it! Thanks for posting up Ricky. Did the guide from the 80's give you guys credit? Maybe you never reported it? How old were you guys? Anders- As far as I can tell from google, this was the name of a French television series. Survival-Sometime in the 80's or 90's I wrote to Piola about the route. I recall that he did write back congratulating us on the first ascent. However, the route never made it into the guidebook. In 1976, Mike was 19 or 20 and I was 21. Rob was a year or two older, I believe. I always wanted to do something like that, but it always seemed there were so many established awesome routes to do, that it was hard to fire up for the "project". Rick, you and your buddies showed up with an amazing skill set in Cham those years. Thanks for the trip down Rue de Memory. Hell Yeah Rick, looks like the real deal. Looks like a bunch of others have got to enjoy our route too, what more could you ask for???? The banana shot is good, but my favorites are the biner break and the sunlit one, two photos after it. Thanks for the compliments, folks. It was a fun outing, but I wouldn't overstate its difficulty or importance. The "Fissure Brown,"on the West Face route a little ways to the right was done in 1954 and it has harder moves on its famous off-width section than our route. It isn't an Astroman, just a nice looking line that turned out to be less steep and easier than it looked from town. And I don't think the exclusion from the guidebook is proof of French perfidy, either. Piola seemed like a good guy in our correspondence and it was probably just an oversight. What I would be interested in knowing is how long it was until the next all nut ascent of consequence took place in the Alps. Perhaps just a sternly raised eyebrow! Rick, more... Great TR. Looking back to those incredible seasons I wish I had spent more time on rock routes! I think I was too focused on ice and mixed. //Merci pour l'info de Blaitière: R.Acomazzo m'avait envoyé un courrier en 1990 à ce sujet, que je garde précieusement, avec une photo par ailleurs. He is, but I should just point out he's Swiss, not French. I am a guidebook geek and have bought several Chamonix guides over the years. When I looked up my copy of Piola’s guide to quote the passage above, I tried to find the date of publication, but did not follow through and I mistakenly assumed that it was a version of the guide after the one that prompted my letter to Piola. By the way, Piola is a revered figure in the Mont Blanc Region for establishing and equipping dozens of excellent rock routes and for publishing his outstanding cragging guide to Chamonix. When I was snowboarding there last year, a Courmayeur guide told me he and his friends were forever grateful to Piola for the great fun they have had on his routes, and as a result of his guide. He produced his first Mont Blanc topo in the early 80s, Later, in about 1988 he updated the old topo and made it into two volumes - there were a bunch of routes on the Italian side of the range added and I think he left out some that were in the original (maybe the Dru and the Aiguilles Rouges - I haven't got my guides with me here so can't be sure). Since then (in the Massif) he has only relatively recently produced two more guides: the Envers des Aiguilles and Vol 1 of the Aiguilles Rouges. Vol 2 Aigs Rouges should appear this year. In the intervening years he produced a couple of guides to the local limestone areas. Thanks for the photos, the history, and the tr! I've climbed Nabot Leon (the easiest route up there), in the warm afternoon sun, great rock, great location, and easy access with the tram. Piola has not only contributed to route development in the Mont Blanc range but also elsewhere in the Prealps with fantastic limestone routes just about everywhere. From the little I've interacted with him, it's definitely an oversight and not done on purpose. Bruce-Rob lives in Southern California and is still gets out bouldering and climbing . I don’t recall that Rob’s wife (who traveled through Europe with him in 1977) went to the Denali area with him when he climbed Foraker in 1976, so maybe you have him mixed up with someone else. If Rob ever soloed through the outback, he didn’t tell me about it. Thanks also for mentioning your friend who named his kid after Tobin. I have met, or heard of, a couple other climbers who have honored Tobin that way. He made a big impression in his 25 years. I suspect that this reference to “entirely free” means “French free”, i.e., pulling on pitons, but without etriers, and from what we saw, this was the prevailing style at the time. 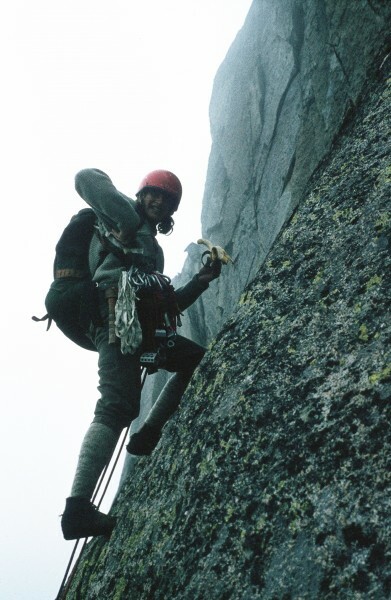 But there certainly were French free climbers operating at a high standard around that time, including Jean Claude Droyer, with whom I shared a telecabine, crossing the Vallee Blanche in 1977. Congrats. Hope the record gets corrected in print too. Great stuff, just like a fairytale... TFPU! Thanks for posting this TR! Great read and even better that Americans were there doing FAs!! Ah, we were young once! Good stuff, Rick. Mike looks like an aping Eastwood toting that green Ultima Thule. 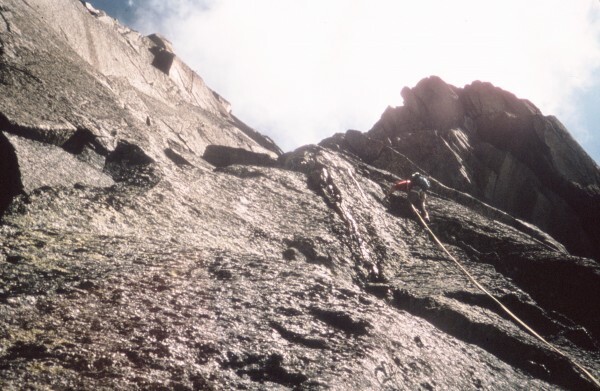 In the early '60s Lee Harrell mentioned climbing a new route on the Blaitiere with the late John Harlin II as I recall, about the time Harlin was preparing for his Direttissima Rt. on the Eiger. I can see why Lee was drawn there-an elegant looking piece of stone. Nice report! I'm always happy seeing reports of European exploits; that's the wellspring of our present day activities. Thanks for the comments, all. Would like to get back there some time and try some of the other routes on the Red Pillar. 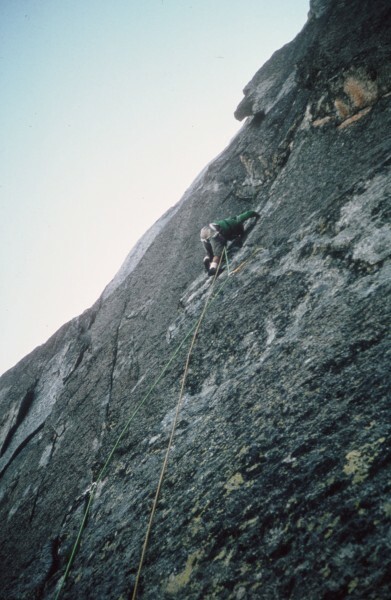 Keith-I am interested to hear that Lee Harrell, who with Pat Callis established many of the classic routes at Suicide Rock in the 1960's, was climbing with John Harlin in Chamonix in 1966. Would love to hear more about that. 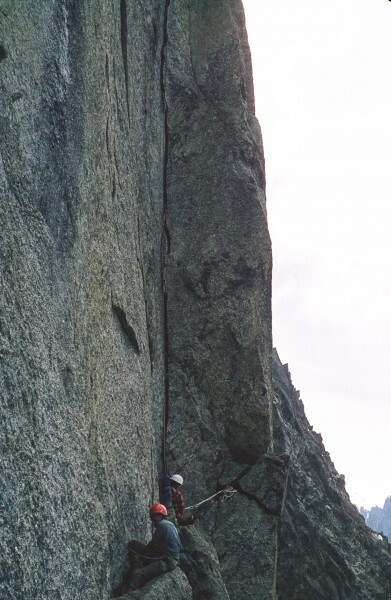 RE: Suicide ~ I did a few FAs with Callis, Harrell and Paul Gleason in the late '60s on the "Buttress of Cracks". Paul and I did the FA of "Pass Time" with Lee, and teamed up with Callis and Harrell on "Frustration" e.g. We never 'reported' FAs back then. 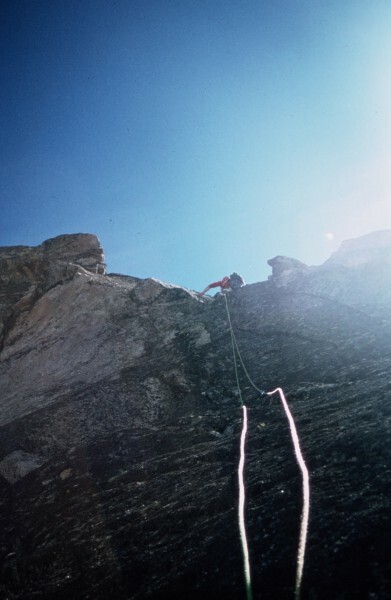 Lee just sent this photo he took in 1964 of John Harlin on their FA of the route I mentioned on the Blaitiere. He writes -"the big face came later". I'll post again if I learn any more. Prime example of a blast from the past!